Originally, the issue was teacher-student contact, a response to the fear that teachers would just upload stuff and not do any work. Now they’ve decided to legislate pedagogy, and insist on student-student contact. I know several faculty who aren’t happy about this, because their pedagogy doesn’t rely on student-student interaction. Rather their course is set up to maximize student interaction with the course materials. Several instructors I know engage students in highly individualized feedback. One responds to each student’s posted analysis of each reading each week. Another evaluates submitted assignments in great detail. They both have in-depth, ongoing, substantive contact with every single student. Neither relies on students interacting with each other. So this is bogus from the start, pedagogically speaking. The state has decided to intervene in methodology, based on research that is questionable at best. Studies using physical classroom research, for example, compare straight lecture to group activities (active learning). They tend to ignore the many other activities that can be assigned in an online class but aren’t reliant on other students (for example, instant feedback on a quiz question). Other studies of “community” in online classes focus on the affective domain rather than the quality of work. While it is an option, it is not necessary to have student-to-student interaction for a student to feel like part of the class; that can also be achieved through instructor presence, student-instructor interaction, and student-content interaction. Focusing on students interacting also ignores the teacher-student tutorial model, which provides individualized responses. Many students want individual attention far more than they want “community”. But we don’t make the rules. So if it’s there and it’s real, it’s fine. An instructor, without being pressured, wouldn’t have such interactions if they didn’t believe them to be important or meaningful. In the case of “considerable”, a class that has a lot of meaningless discussion would also be covered. This brings us to Lisa’s Rule on Rules: when confronted with legislative stupidity, it is usually best to look at what you’re already doing and see if it can be used to demonstrate that your work already complies with the new rule. Tonight I attended a wonderfully balanced session on the new pending rules. It was led by Sean Davis, our wonderful sociologist at MiraCosta. He noted the controversy over the rule, but focused on options for how to create such interactions. These included discussion/question forums, emails between students, peer feedback, student groups, interactive video (we have a pilot for Arc), video conferencing, chat, and collaborative projects. I would add to this group annotation, which is a major source of interaction in my own classes. For those instructors who do any sort of student-student interaction, it should not be hard to justify what they do within the new context. It is indeed these instructors who are most concerned about the new law. Most instructors have a discussion forum. Some of these are problematic or meaningless, but if they do it every week, they’re good. I can justify much of my students’ work, because in addition to annotating written primary sources, they post their visual sources in a forum, and “like” the sources they enjoy. “Like” is interaction, and if you ask students to “like” for a purpose (they plan to use the idea, or vote up ideas the class will use), it’s meaningful. This sort of “passive interaction” or “accidental interaction” can satisfy the rule. Passive interaction is like a cocktail party — everyone is in the same place but not necessarily at the same time or for the same purpose. But they see what the others are doing, and adapt their behavior according. Open forums where students post assignments can serve this purpose. Particularly if they’re graded only individually, and privately, posted student work can help other students see where they stand, demonstrate alternative ways of doing the work, and serve as examples. So the professor who has students submit their assignments directly to her could instead have them submitted to a forum (if necessary, the forum could be set not to show other work until ones own work is submitted). The prof who responds to his students individually after they post in a forum could add a summary post noting the contributions of particular students, asking that they be used as examples. I admit that I am completely uncomfortable with asking students to email or message each other privately, and I have never been a fan of peer feedback although I know people who do it well. And I remain appalled (I am often appalled) that the rules never seem to care about the interaction between the student and the content. Where’s the rule that says courses should include deep, sustained, meaningful interaction between the individual student and the materials being studied? Where’s the rule that says courses should integrate important and meaningful contact between the student and the norms of the discipline? It’s bad enough that so many courses contain discussion forums because the instructors think they should. That has been going on for years, even before this rule was enacted. The inevitable response to the new rule will be more one-post-two-reply “discussions” that frustrate online teachers and become rote and meaningless for students. Surely the new rule must be a misguided attempt to replicate the classroom, except perhaps the people who wrote it haven’t been in one for awhile. 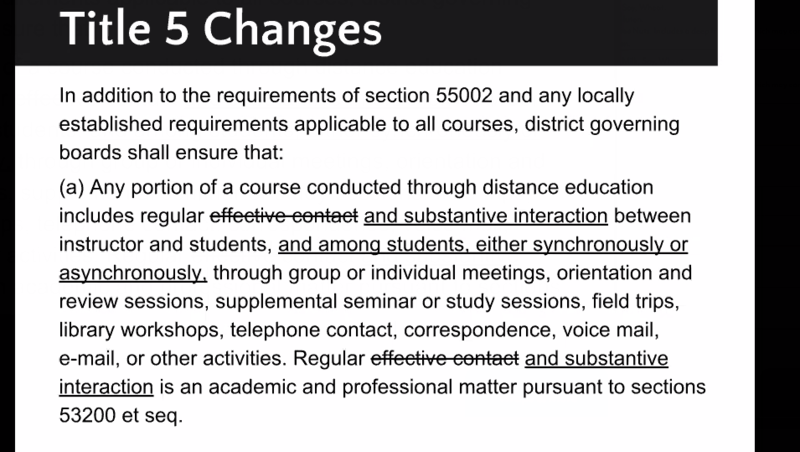 Where’s the rule requiring students in a non-distance education class to be forced to interact with each other? In the meantime, such attempts should be dealt with by showing that what we already do satisfies the rule. It’s just a shame that we have to.